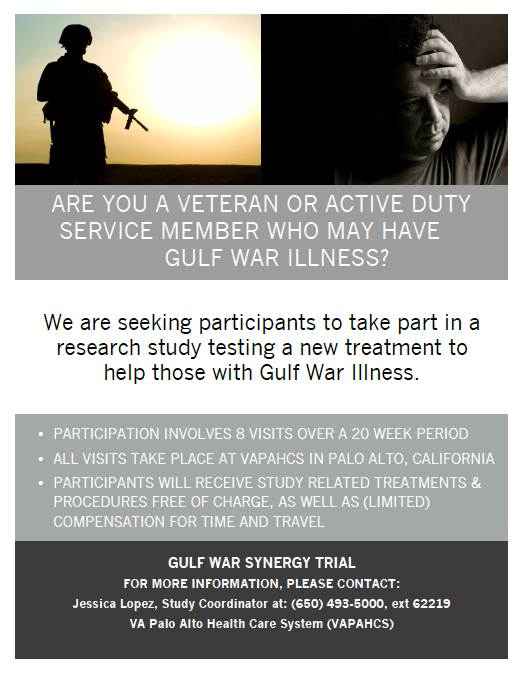 The GWI Synergy Trial is a clinical trial testing a combination of mitochondrial support nutrients and a low-dose stimulant drug for the treatment of GWI. The trial is funded by the Gulf War Illness Research Program (GWIRP) within the Congressionally Directed Medical Research Programs (CDMRP), which are carried out under specific Congressional direction by the Department of Defense. My husband is a GW1 USAF veteran. He provided fuel pump systems support in Pittsburgh, New York and only visited Kuwait for a few days while on medical leave recovering from knee surgery. He sustained a TBI while performing this service and is noted in his military medical records. 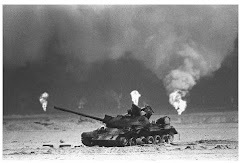 As part of his job, he was drenched in JP4 in its liquid state daily and stayed in the soiled uniform in order to provide air support for the mission until the end of his workday which was sometimes 12 hours per day and five to seven days per week. He began showing symptoms before being honorably discharged for medical reasons in 1992. He is being treated for epilepsy, migraines, tremors along with a host of other symptoms. In 2014, a brain MRI conducted in March showed one lesion and by August a second MRI conducted at Palo Alto VHS - WRIISC program showed five lesions. That study along with a through neurological evaluation revealed MS as a possible diagnosis. We were sent back to Anchorage, AK and as of this writing, a diagnosis is yet to be made. With this history, would he be eligible to participate in the study? I have often wondered if he wouldn't be a good candidate as a control subject with his experience. Thank you for your service and continued advocacy. My gulf poisoning took me 15 years, the last 10 as a homeless vet. My illness is service connected as Fibromyalgia, with unique symptoms listed. 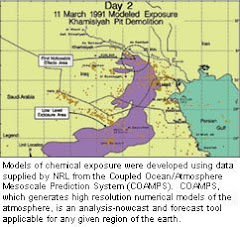 I was poisoned in '88' in the Straights of Hormuz, a small boat mishap was the activation trigger. I was medically discharged Dec 90. There was collusion between most the Federal, state, and county agency's. The CVSO even released my medical and claims files to several govt agencys..And they used DVA against me to disqualify eligibility for HHS,Social Security,IRS,etc, the DA used my records against me in court several times. I made it to WRIISC, and I understand 3 reprimands were issued to VAMC/DVA Wisconsin. I moved to the Philippine Mountains, where I've been 10 years now. Low Dose, Long Term, Multi Chemical Exposure.. The military machine runs on toxic materials, as are the battlefields in which we deploy, it adds up and accumulates, and 30% of people have too little PON Q enzyme to scrub the toxins from the brain stem. Recently I was given a Kato potassium shot for an extreme muscle episode at a local Philippines ER, and in 40 minutes, my pain levels were the lowest in 20 years. I even felt muscles flutter and release, thats a first! It's a treatment for Dengue and Malaria, replacing mineral salts leached out of my body by my constant chilled sweats. Prior med; 600mg gabapentin, 100mg Tramadol, 1000mg Tylenol x 6 times per day.. average pain level 8.. New meds; 10mg Potassium Citrate, 50/650 Norgesic Forte x 3 times per day.. 40mg Esomeprazole x once per day... average pain level 3!! My gut pain is also gone, and I have a good appetite.. 1 (5-10mg) Oxycodone provides added relief for more acute episodes. The muscular and nervous systems short out when too much Potassium,sodium,and Magnesium sweat out of us.. the meds provide the conductivity minerals are bodies need to function, nearly pain free.